Are you aware there are different types of investment funds? We’re not talking about ones that invest in different sectors or geographies; instead, we mean the structure of the funds. You may think the underlying assets inside a fund are the only things that matter. In reality, there’s a bit more to it. Stick with us and we’ll explain why. Two of the most common types of fund are unit trusts and open-ended investment companies (OEICs). They share many traits but they also have some important differences. Unit trusts are a form of ‘open-ended’ investment fund in the UK. They’re termed open-ended because the fund manager can create new units (similar to shares) in the fund to meet investor demand. These units can be bought or sold at any time. This differs from a closed-ended fund, which issues a fixed number of non-redeemable shares. Investment trusts are closed-ended funds. In 1997, laws were introduced allowing the creation of OEICs, which are also open-ended. Over the last decade OEICs have become a lot more common and many unit trusts have converted to the OEIC structure. This is due to the relative simplicity of OEICs and the fact they can be sold into different countries across Europe. ‘Just about all new funds that are launched are structured as OEICs, indicating the direction of travel for the asset management industry,’ says Ryan Hughes, head of fund selection at AJ Bell Youinvest. In many respects unit trusts and OEICs are the same. They’re open-ended and the price of each unit depends on the net asset value of the fund’s investment portfolio. as income or reinvested in the fund. 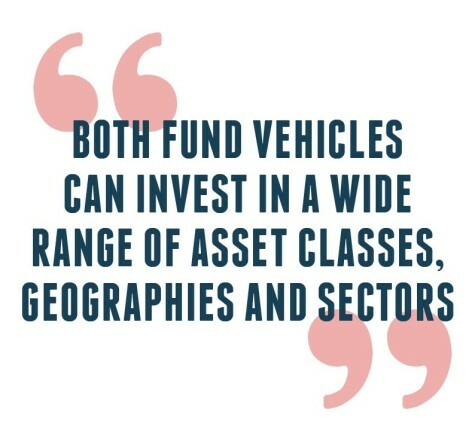 Both fund vehicles can invest in a wide range of asset classes, geographies and sectors. A subtle difference is a unit trust is governed by trust law, whereas an OEIC is governed by company law. 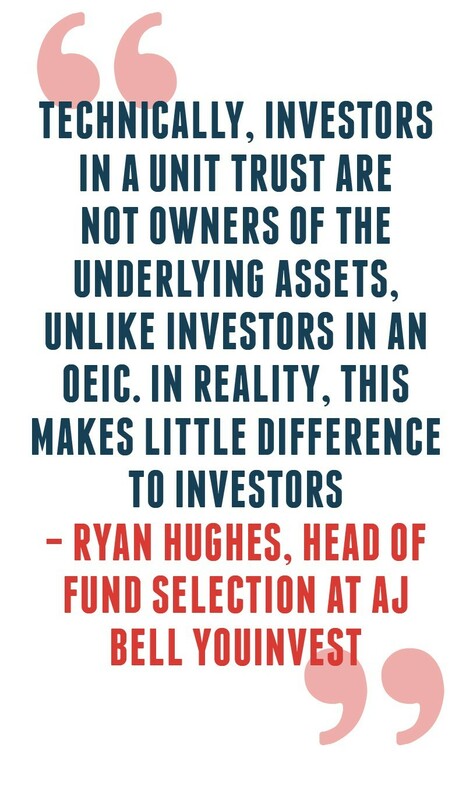 ‘Technically, this means investors in a unit trust are not owners of the underlying assets, unlike investors in an OEIC. In reality, this makes little difference to investors,’ says Hughes. If you invest in a unit trust you buy units whereas if you invest in an OEIC you buy shares. The major difference between unit trusts and OEICs is the way they’re priced. Unit trusts quote a bid price and an offer price; OEICs only quote one price. With unit trusts, the bid price is the per-unit price you’ll receive if you sell your units back to the fund company. It’s usually based on the bid price of the underlying securities held by the fund. The offer price is the per-unit price you will pay to purchase units in the fund. The difference between the two prices is called the bid-offer spread. The spread aims to ensure new or redeeming investors don’t dilute the value of existing investors’ units. Jonathan Miller, UK director of manager research at Morningstar, says fund managers can avoid transaction costs when investors buy and sell units on the same day because they’re essentially matched off against each other. Unfortunately, these savings aren’t put back into the fund. ‘Instead they create what’s known as a box profit, with the common procedure being that it trickles down to the fund company’s bottom line. We believe this is to the detriment of investors and is an opaque structure,’ Miller says. The Financial Conduct Authority is currently seeking to ban the box profits practice and ensure that any benefits accrue to the fund, not the firm. OEICs publish a single price each day, making it easier for investors to understand the cost of investing. OEICs have a mechanism called ‘swing pricing’ to protect existing investors when there’s an imbalance between buyers and sellers. The fund can artificially reduce its net asset value to account for the extra portfolio trading costs created by significant buying or selling activity. Can a unit trust fund become an OEIC? Several unit trusts have converted to the more modern OEIC structure over the past decade and this trend is expected to continue. Janus Henderson, for example, converted its UK property unit trust into an OEIC structure so it could then move towards PAIF (property authorised investment fund) status, which is more tax-efficient. It is possible for an OEIC to convert to a unit trust but this is very rare. In 2003, New Star converted the Aberdeen Equity Income OEIC sub-fund into a unit trust (named New Star Equity Income Unit Trust) in order to bring the fund in-house and assume ownership. The unit trust was subsequently acquired by New Star Investment Fund OEIC. Instead of carrying out a fund conversion, Jupiter has announced that in 2018 its unit trusts will move to single pricing for buying and selling fund units. A Jupiter spokesperson says this aims to ensure transparency and value for clients and align its products with the common pricing approach in the industry. Box profits, which totalled £12.8m in 2016, will be removed from Jupiter’s future income stream.